There you will find information about my services to promote Total Immersion Swimming in Austin, TX. What is Total Immersion Swimming? Total Immersion Freestyle Swimming is a paced, hyper efficient, core based swimming technique. The first goal of TI swimming is Kaizen: To use every swim practice to improve technique. Many errors in swim technique are hidden by a swimmer's speed. By swimming slowly while learning the TI method, new skills arise for better flotation and propulsion. Later, the challenge is to increase speed while maintaining optimum technique. 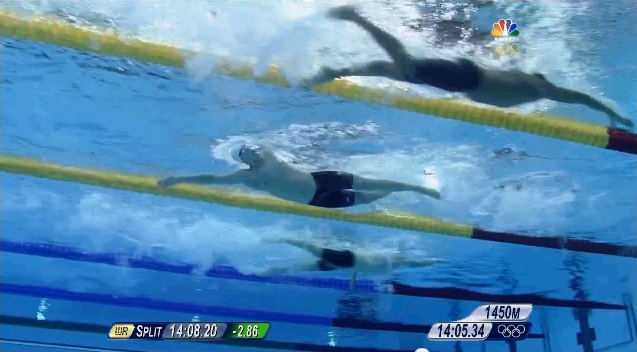 Imagine experiencing swimming as flying. Imagine feeling supported by the water instead of fighting the water. Imagine the whole-body sensation of striking a balance between gravity and buoyancy, and propelling through the water with hidden power and visible grace. 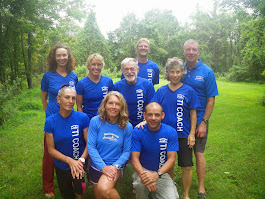 Terry Laughlin, the founder of TI swimming, explored ways to improve balance, propulsion and streamlining in water, and this led him to the realization of how swimming can maximize endurance by shifting muscular effort away from the arms and legs to the deeper power of core muscles in the torso. The result is a hyper efficient form that floats the body in horizontal position, takes advantage of gravity and core muscles for propulsion, and minimizes splashing and resistance in water. If you usually swim the length of the pool in 25 strokes, and if you could reduce that to 18 strokes by using a 2-beat kick and swimming/gliding with core muscle power, you have gained a major health benefit by reducing the likelihood of overuse injuries - especially of shoulders, but also of hips and knees. Optimum efficient technique can be measured by counting the number of strokes needed to cross the length of the pool (based on the swimmer's height and the pool's length) and by the overall distance that can be swum without fatigue. TI swimmers don't practice 'struggle.' Instead, they work within a robust self-analytic system that allows them to measure when technique is degrading, to pause/rest, and then to self-diagnose using the TI 'focal points' to get back on track. It's a proven system for continuous self-improvement in swimming. By establishing a firm foundation of proper swim stroke technique, TI swimmers can take their good form to the "next level" of desired fitness, whether that is aerobic capacity improvements, whole-body strength and tone, postural fitness, faster stroke speeds or covering greater distance. Count the number of strokes needed to cross one length of the pool and rate your effort (on a scale of 1 to 5) before trying this. 1) Release your head's weight. Visualize a laser beam projecting from top of head in alignment with your spine. 3) Let your legs relax. See if you can get them to draft behind your torso. 4) Just swim "quietly" with less noise, splash, and bubbles. Then count the strokes needed, while swimming with any or all of the suggestions above, and rate your effort (on a scale of 1 to 5). Perhaps you will discover the new ways of experiencing and challenging your body that Total Immersion Swimming offers! From TI founder Terry Laughlin: "... grace is a much rarer quality in swimming than speed. Grace is also more attainable, as it doesn’t require youth, strength, or special talents. But, for those also wishing to maximize their potential for speed, a highly efficient stroke is the surest way to achieve that. " Terry Laughlin, founder of Total Immersion Swimming, welcomes new coaches including Diana Prechter of Austin, TX. Balanced to Move On Land and Sea by Emily Eisen M.Ed.